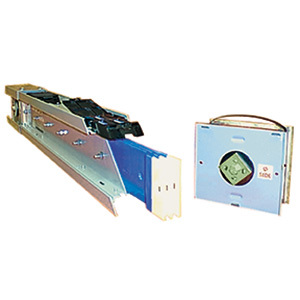 GE Spectra Series Busway is a custom designed modular electrical power distribution system and is available in both feeder and plug-in styles. GE Spectra Busway replaces wire and conduit in most applications with reduced installed costs and improved reliability. Spectra Series busway is at least 50% lighter than comparable wire and conduit – and lighter than competitors’ busway, too. This simplifies design, reduces installation time and may lower your total installed cost by up to 75% versus wire and conduit. The compact Spectra Series also allows runs in more places, such as around and between existing structures. Removable isolation joints mean maintenance and modification are done easily and with minimal downtime, which may lower your operational costs versus wire and conduit as your building needs change. Lighter, smaller, lower cost, easier modification. Customer feedback and structured focus groups provided the foundation for this busway product. Customers asked for lighter and smaller power bus systems that were flexible enough to expand or realign in facilities as needs changed. They needed higher amperage tap-offs and the ability to isolate sections without taking the entire structure offline. They asked for joints that were sturdy, safe and easy to maintain, but were flexible enough to accomodate late-point installation issues. Field-adjustable isolation joint allows for ±½” per joint providing flexibility on the job-site.